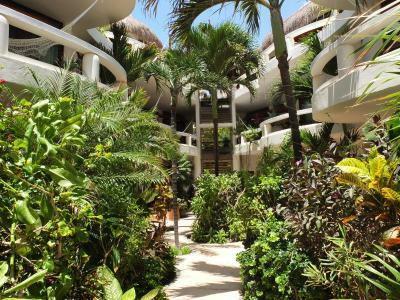 Lock in a great price for Playa Palms Beach Hotel – rated 8.4 by recent guests! The room is cozy, I love the balcony and the hammock. Very clean. The room was a good size with nice decor. The bathroom was bright with lovely tiled shower with great water pressure and loads of hot water. Convenient electronic room safe. Near sound-proof sliding glass door onto balcony. 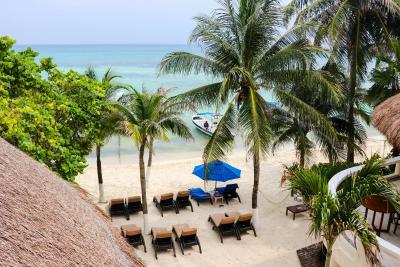 Great views from the balcony of palm trees and a wonderful slice of beach where we could watch the pelicans and other sea birds, fishing boats and beach walkers. Daytime room service from a small menu with reasonable prices. It was convenient to all the restaurants and shops. 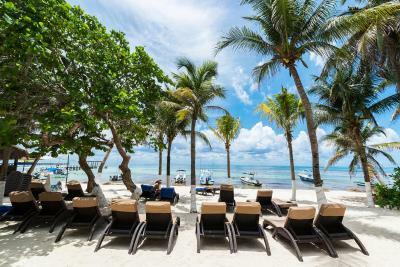 Playa Palms Beach Hotel This rating is a reflection of how the property compares to the industry standard when it comes to price, facilities and services available. It's based on a self-evaluation by the property. Use this rating to help choose your stay! 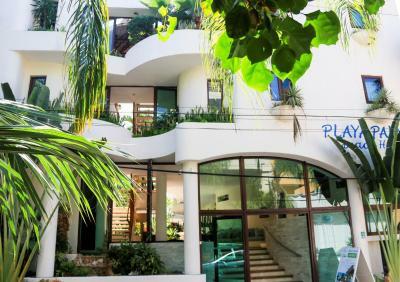 One of our top picks in Playa del Carmen.Offering an outdoor pool and a private beach area with stunning views of the sea, Playa Palms Beach Hotel is located steps from famous 5th Avenue and its cafeterias, shops and nightclubs. Free WiFi is available throughput. 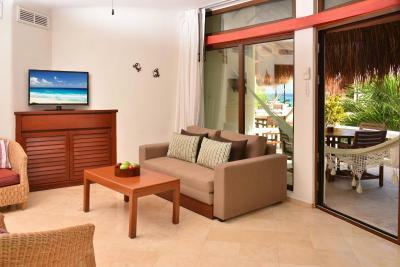 All units are air conditioned and include a seating and/or dining area, equipped with a flat screen TV. Some units also have a kitchen, fitted with a toaster. 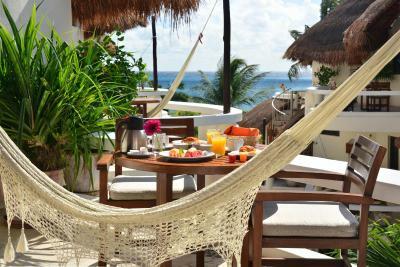 All rooms come with a balcony, hammocks and some have partial sea views or garden views. Guests can request free Continental breakfast to enjoy in the room’s balcony and also there is a variety of drinks offered at an extra cost. Spa services and a tour desk are available. 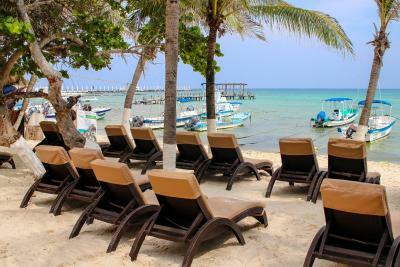 Playa Palms Beach Hotel is about 60 minutes’ drive from Cancun International Airport. 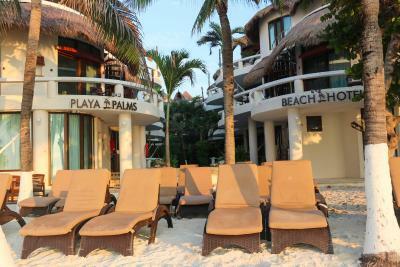 When would you like to stay at Playa Palms Beach Hotel? 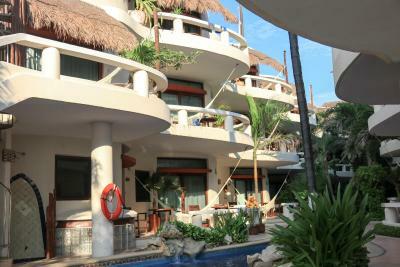 This stylish studio has a large furnished balcony or terrace with partial ocean views. Some feature a queen bed, while others come with additional day bed. 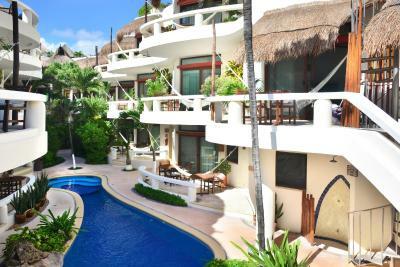 This stylish studio for 2 people is on the ground floor and overlooks the tropical gardens. 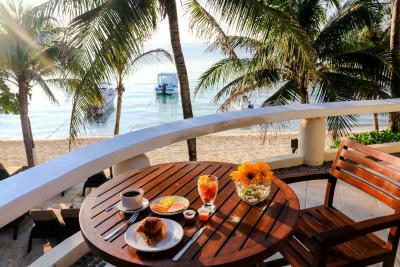 Next to the ocean, it has a semi-private terrace with a dining table for 2 people. 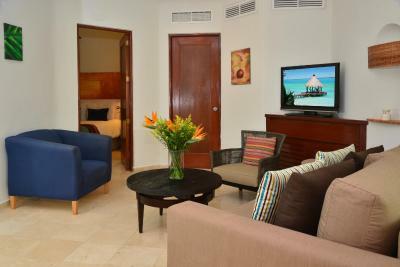 This air-conditioned 1-bedroom suite features a fan, safe, laptop safe, satellite TV, iPod dock, microwave and minibar. The bathroom has shower. 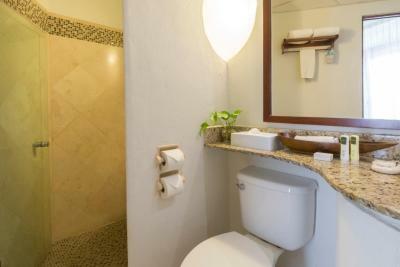 The rooms at the Playa Palms Beach Hotel are stylishly furnished with personal details, with a captivating, relaxing ambiance. 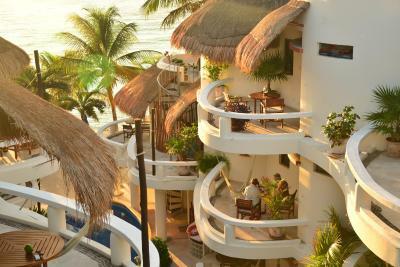 An atmosphere that is a reflection of the paradise that surrounds the hotel. House Rules Playa Palms Beach Hotel takes special requests – add in the next step! Playa Palms Beach Hotel accepts these cards and reserves the right to temporarily hold an amount prior to arrival. Please inform Playa Palms Beach Hotel of your expected arrival time in advance. You can use the Special Requests box when booking, or contact the property directly using the contact details in your confirmation. breakfast was poor, bad smell in the room, do not come on April, the seaweed is all over and you cant go to the beach near the hotel!! Food selection is limited, bed was a little bit soft. The beach is full of seaweed and boats. We can hardly swim. There's very little to complain about with this property! If I had to be very picky, I would say that I wish that the beach were a little wider, and a little less eroded, but there isn't much anyone can do about that. We still had a wonderful time lounging in the sun, having beers on the comfy chairs, and making friends with people sitting next to us. If you're really stuck on a huge beach where you can spread out from any other visitors, it may not be right for you. Our room was lovely, and having a balcony made it feel so luxurious! Unlike some other folks, we had zero issue with sound, even with the clubs going at all hours. We *maybe* heard faint bass thumping, but we had to listen for it, and even then, we weren't sure. The bed was comfy, the room was immaculate, and the decor was nice without being overwhelming. There was even a little bookshelf with books that (I assume) other travelers had left for others. The breakfast was excellent, especially for being complimentary. We received tropical fruit, delicious juice, pastries and some slices of bread, coffee, and yogurt! The staff was absolutely amazing - friendly, knowledgeable, prompt, and helpful. The front desk staff was welcoming, we had a wonderful tour booked through our knowledgeable concierge, the cleaning and maintenance staff managed to completely unblock a shower drain (we discovered it on our first night - it happens with so much sand and being at sea level - in only a couple hours, and our friend Daniel provided excellent service at the beach and pool. The location was just 2 blocks off the main drag (5th), and it was totally chill and not flooded with hectic foot traffic. We liked that it was so quiet despite being so close to all the shops, restaurants, and clubs. 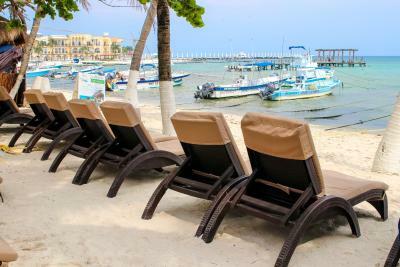 Playa del Carmen is having a problem with sea grass and it creates an awful stench as it rots on the beach. Our stretch of beach had several sections with tiny incoming streams that may have other causes for bad odors. Lovely to look at from the balcony, but not as nice to walk on. Unlike Cancun, I ended up with mosquito bites, so bring bug spray. We didn't have running water at 6 am before the flight. We asked for any paid breakfast option before 7 am and we were denied. Somehow on our level by our door, there were 2 ladders for no reason. 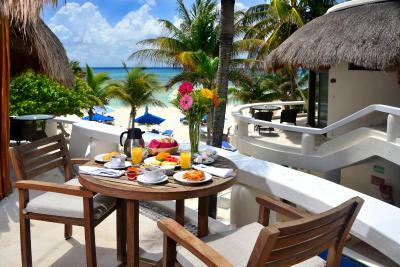 I liked the continental breakfast and that you could sit on the beach and have someone serve you drinks and food if you wished. They have a pool as well which was nice to jump in if you didn't want to go in the ocean. 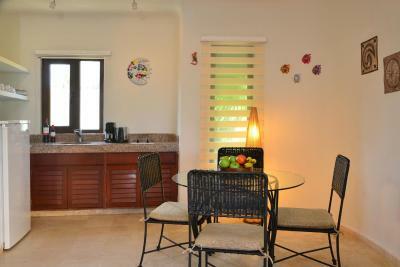 The rooms are fully functual, comfy bed and kitchen with coffee machine, fridge and a tv.